If you need to have your Konica Minolta camera and/or DSLR accessories fixed, now is the time as Sony says it will cease to repair those items at the end of 2010. The paragraph below was taken from the Sony esupport website. Notice of Pending Service Closure for Konica Minolta Products. Sony has been providing customer service for Konica Minolta cameras and related products since April 1, 2006. As of January 1, 2011, Sony will no longer provide customer service for Konica Minolta products. If you have first frame black problems with your KM 7D or 5D, you had better send it in. Of course, you can always use a different repair facility, but parts issues may come up at some point. I had the FFB problem on my 5D, but it didn't bother me, so I continued to use it until I bought the A100. I've been playing with the new A33 lately. It's pretty good, but I noticed it adds strong color fringing as compared to the A700. Check out the samples below. Look at the pink flowers on the left and the thick red fringing from the A33. Both were taken at the same point, with the same settings using the CZ 16-80mm lens. The exposures are slightly different, with the A33 exposing about a third to half stop longer. The background foliage is moving some in the wind, so the whole crop isn't exact. I also see the A33 has a Nikon D40 processed look, meaning a pinkish cast, although that's easy to change with most PP software. At longer lengths, like at 80mm, the differences aren't so noticeable. These are just initial thoughts, I'll probably add more as time permits. The 100% crops below were taken from near the far right side-middle, at F/5.6, 16mm 1/320sec ISO 200 focused at the infinity hard stop. SLT-A33 on left, and A700 on right, CZ 16-80mm at 16mm, from far right middle area. People (for quite some time) have expressed displeasure with the reliability of my primary email address. The problem seems to be that their messages are not going through. Many people have had no problems, but just to make sure everything gets through from now on, I'm going to delete that address and use only the yahoo address, which seems to work fine for everyone. I answer all questions as best I can, usually in a timely manner. I also answer hate mail, although I limit replies to one per sender, per month! But seriously, for all you folks that tried to send a message, but got no response, it's most likely that I didn't get it, sorry. Ok, I guess we've had enough Sony bashing for now, so let's move on to more positive news. I think I'm going to buy the A33 (cheap and small) as a back-up camera(!) so I'll let you know what I think of it after I run it through some tests, and see if the ghosting issue is a deal killer. Hopefully, that purchase will allow me to get by until Sony releases a replacement for the A700. Believe it or not, the only digital cameras I own are the A900 and A700, along with a point and shoot. A new Minolta lens manual has been added to the lens manual page. Thanks to Dr. Roy from parts unknown for furnishing an English and Spanish copy of the owner's manual for the Minolta AF 300mm F/4 APO G and 400mm F/4.5APO G, and thanks to Michael, also from parts unknown, for fixing up the files and getting them ready to post on the site. I'm too lazy and/or dumb (choose only one please) to do it myself. Go here and scroll to the bottom of the page for the links. Sony's new lenses are available now from Sony and some other outlets, unfortunately, B&H Photo still isn't showing any in stock. No one has time for a little pdf work? See post below. Here's a letter to Sony from a German Sony user forum a reader sent me, I believe the author's name is Marco. Scroll down a bit for the English version. It's pretty good, but I doubt Sony will respond. I've been answering quite a bit of mail after my last post, and the clear consensus is; Sony's current marketing strategy isn't instilling confidence in semi/pro users, that's no surprise though. I'm sure many people (including myself) wonder why Sony doesn't just stuff one of their new sensors in the current A700, change the firmware, and sell it, I'd probably buy one. I don't need all the fancy new stuff like video, live view and street sweeper mode. I should say live view and an articulating screen are handy, but aren't necessities. Oh well, I'm just thinking out loud. Let's hope Sony gets on the ball quickly, otherwise I don't think they'll have much, if any market share in conventional DSLRs. If they're making crazy profits off the NEX system, and nothing on DSLRs, then I don't blame them for shelving development on DSLRs, I just wish they'd let people know what their intentions are. People will only wait so long. October already!! Time now for some random thoughts on Sony's DSLR direction, and pdf help needed, see second to last paragraph. I've been getting some mail lately from folks that are thinking about switching systems, like from Sony to Canon or Nikon. Their concern is the same as mine; is (are) Sony really interested in continuing to developing their intermediate to pro level cameras. If you recently bought a Sony DSLR beginners model, (anything below the 700 series) in the last year or two, that's great. But what do you do if you want to take a step up, and need a more advanced model with quicker access to manual settings, faster and more accurate focusing, an AF illuminator, and full support for wireless flash etc? Well, you can buy the A850 for $2000, then replace your "DT" lenses with full frame lenses, which will cost you several thousand dollars more depending on what you need to replace, or you can dump your Sony stuff on eBay and switch to Canon or Nikon and buy their fabulous, brand new, just released intermediate models. If you want an intermediate level Sony DSLR right now, you can buy a three year old used A700 on eBay and hope it works. Sony's recent CZ, and newest "G" lenses are really good, and probably just as good if not better than Canon or Nikon equivalent lenses. What bothers me is their lack of focus on a particular segment of the DSLR market. Sony has made no head-way into the sports market or photojournalist market in four years. In my opinion, Sony should not try to capture those segments. They've been floating a fake 500mm F/4 lens for a couple of years now, and let's hope they leave that one on the cutting room floor in favor of more useful lenses, aimed at a different, and more manageable segment. Seriously, how many people are going to look to Sony when thinking about that type of lens, with a probable cost of $8000-$9000? Can you see a customer at the sales counter; Yes, I'll take that top of the line Sony A55 for $749, and that 500mm F/4 telephoto lens for $8500; and the clerk says, with tax, that'll be ten grand! This is not a likely scenario. Here's a scenario I'd like to see soon in a Sonystyle outlet store or any camera shop: customer comes in and says "howdy, I'd like to check out a couple of your tilt-shift lenses, like the Sony Carl Zeiss tilt-shift 16mm F/4, and 24mm CZ T-S F/4." "Let's pull one of the new Sony A970 36mp full frame cameras out of the box too." The sales clerk says "no problem, and have you seen our just released CZ 18mm F/3.5, CZ 35mm F/2 and CZ 50mm F/1.4 prime lenses?" The customer (probably me) says "no, but I'll take 'em all." The scenario above may be fantasy, but it's the direction I'd like to see Sony go. There is no 35mm DSLR camera company that really caters specifically to the landscape/architectural/interior photographers, although Canon's 17mm tilt-shift lens and 5DII is now widely used for interior shoots. This segment of photography could easily be filled and dominated by Sony, assuming careful research, planing and execution. Right now, Sony is clearly going for the low-end "wow" factor with the introduction of the NEX system and translucent mirror cameras. Those cameras have their place, but I'm not interested in them. Hopefully, they won't forget about the pro market, if they do, I'll be jumping ship for Canon. The Sony A900/850 with the newest lenses give excellent image quality, and in some ways superior to Canon or Nikon, especially of the money. If you have a good A700 or A900/850 and aren't in need of a specialty lens that Sony doesn't offer, there is no reason to switch systems. If you have a sub 700 series Sony APS-C camera with only a few lenses, and are needing a more advanced APS-C camera very soon, then you may want to look closely at another system. Try not to give up on Sony yet, they might get their act together in the near future, and come out with some really good intermediate and pro camera bodies and accessories. I'll give Sony about six months to please me; I'll let you know if and when they do!! What do you think about the thoughts and scenario above; are you in concurrence, or do you think I'm nuts? email me your thoughts. On another note; I need help with some very minor pdf work, like adjusting a pdf copy of a lens owner's manual. Anybody interested? let me know. 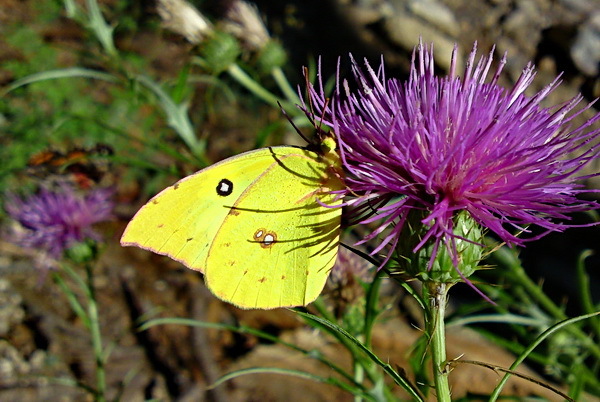 Below is a picture of a butterfly and thistle. I took it while hiking in the local mountains with the Sony Ericsson C905a camera phone. It's a crop of the original, and it still looks great! EXIF is ISO 64, 1/1250s, F/2.8 and -0.30 eV, and macro mode. If I told you it was taken with the Sony A900 and CZ24-70mm lens, would you question it?